Use the New Search Filters on MilitaryByOwner! Noticed anything different around here lately? 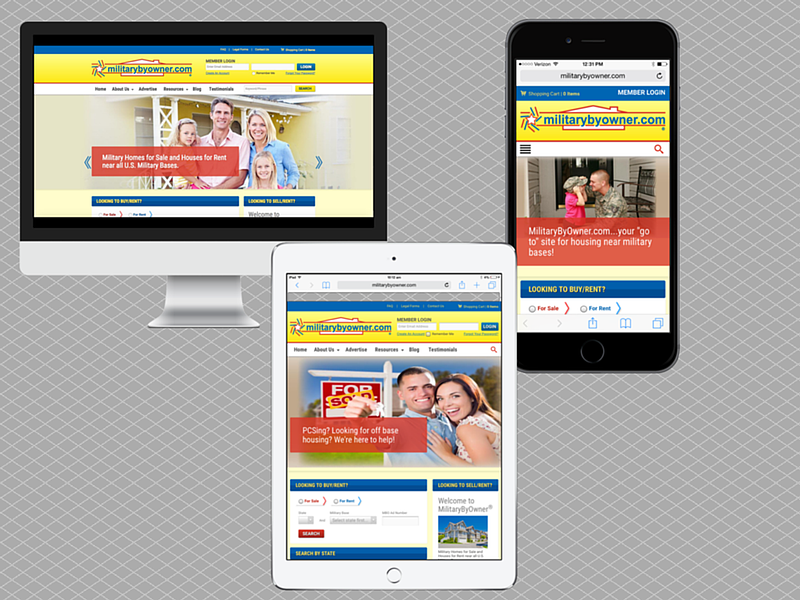 MilitaryByOwner has updated its site to a new, responsive site! Learn how to make the best use of the advanced search filters! These changes will help you more easily find a home at your new duty station. The changes have also helped to optimize the site in such a way that potential home sellers, home buyers, and renters can now more easily find your home in a basic online search, which should ultimately help bring you more options! The more options in your home search, the merrier. But, sometimes too many options can leave us in a state of analysis paralysis, so let’s take a look at the great ways you can use our new search functions to help whittle down your home search to help you select the perfect home for your military family! As my military family is planning a PCS to San Antonio, I’ll walk you through my search on MilitaryByOwner’s website. On MilitaryByOwner's previous site, you could input all of your options for your search on our home page. Now, you’re just directed to select whether you want to rent or buy. For this purpose, I selected “Buy,” and then I selected our state, Texas, and base, Lackland AFB. I could also have used the map below. If I selected Texas on the map, I would then have been redirected to a list of bases in Texas as well as a map indicating the base locations, but since I already knew which base I wanted to live closest to, I went ahead and just selected that location. 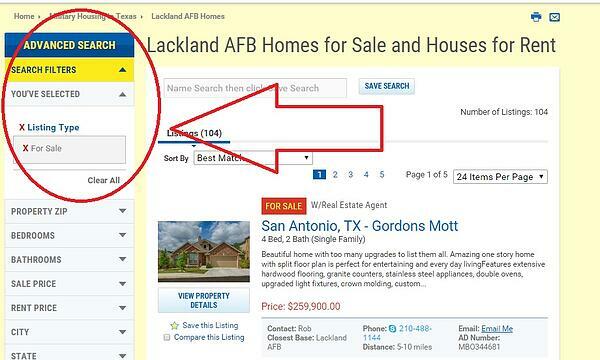 I was then redirected to a page showing that there were 104 properties for sale near Lackland AFB. Lots of options! Great! We first determined how much house we could afford. The first home showing on the page was right in my price range, but I wanted to make sure that I could afford each of the homes I was looking for. So I went to the top left hand corner of the page where it says “Advanced Search,” and selected the dropdown box showing “Search Filters,” as you can see from the picture shown. The fourth option down says “Sale Price,” so I clicked on that and selected my option. Next to the sale price, it showed that there were 44 homes in that price range. 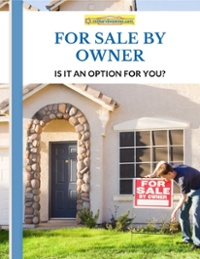 Do You Want an Older Home or a Newer Model? Selecting these two options whittled my search down to 32 properties. I’m making progress! It gets extremely hot in San Antonio in the summer, so I know that I definitely don’t want to park my car outside. One of the advanced search filters is for “Garage.” I selected “Attached Garage,” so that I can walk directly from my car into my home. Now I’m down to 29 homes in my search! Before doing anything else, I want to make sure that I don’t lose my search options, so I go directly to the top of the page above the home listings, and I save my search as “Homes in San Antonio.” When I log into MilitaryByOwner next time, I’ll be able to continue my search from where I left off. Stay tuned for my upcoming post, "How to Find Your Perfect Home," where I share how I searched for more specific items that are on our “must have” list before contacting each of the homeowners.